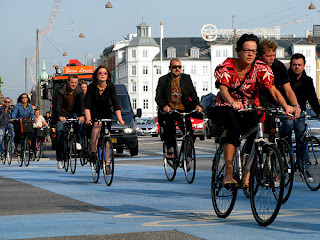 “When all these factors are added together the net social gain is DKK 1.22 per cycled kilometer. For purposes of comparison there is a net social loss of DKK 0.69 per kilometer driven by car.” 1.22 Danish crowns is about 25 cents and a kilometer is 6/10 of a mile, so we are talking about a net economic gain to society of 42 cents for every bicycle mile traveled. That’s a good number to have in your back pocket.